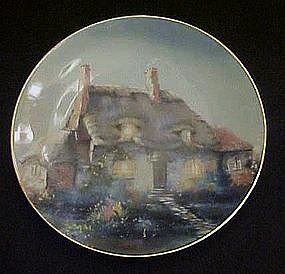 Limited edition collector plate from the English Country cottages collection. This one is titled Lullabye Cottage by artist Marty Bell. Similar to the Thomas Kinkade cottages, but more of a watercolor effect. Plate measures 8 1/2" in diameter with gold trim. Perfect condition but there is no original box or certificate for this one. 1991 Hamilton collection.